Microsoft offers a wide range of online certification programs designed to help you grow your skills and your career. This article will focus on developer certifications. Microsoft Certified Solutions Developer (MCSD) is a certification intended for IT professionals seeking to demonstrate their ability to build innovative solutions across multiple technologies. 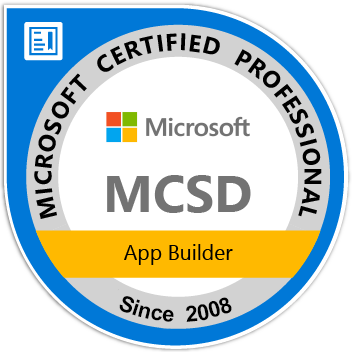 For example, the MCSD App Builder certification validates that you have the skills needed to build modern mobile and/or web applications and services. - Getting a Microsoft Professional Certification doesn’t guarantee anything about getting a job, a raise or a promotion but it does increase the odds. - When hiring someone new, some companies check out his certifications as well as experience. Many hiring managers verify certifications among job candidates and consider those as part of their hiring criteria. Some consider IT certifications a priority when hiring for IT positions. - Getting a certification can boost your self-confidence, your confidence about your skills. - It shows seriousness and passion (you did it all because you wanted to, not because you had to). - The process of preparing for the certification increases your theoretical and practical skills. My key recommendation is to dedicate a specific period to prepare right before the exam. Get some books, attend a course (virtual courses as a personal preference, but classroom courses available) and practice the technologies involved. - Answering to multi choice questions: Proceed by elimination. In case of doubt about the right answer, exclude the answers that don’t make (any) sense, (or that makes less sense). - MCSD: Web Applications. Expertise in creating and deploying modern web applications and services. - MCSD: Windows Store Apps. Expertise at designing and developing fast and fluid Windows 8 apps. There are two paths to achieving this certification-using HTML5 or C#. - MCSD: SharePoint Applications. Expertise at designing and developing collaboration applications with Microsoft SharePoint. - MCSD: Azure Solutions Architect. Expertise covering the full breadth of designing, developing, and administering Azure solutions. - MCSD: Application Lifecycle Management. Expertise in managing the entire lifespan of application development. The Certification Planner is a tool to help you know what requirements are necessary to achieve your next certification. It’s about planning your next steps (your options, which exams to take, in which order). That's it for now. Now get back to work.